Over the Christmas holiday, I had the supreme pleasure to read not one but THREE books, all of them gifts I bought for other people that I then stole back while family members were cuddling the baby. 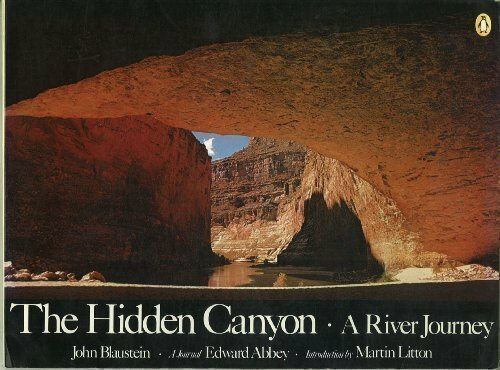 The most luxurious of these was The Hidden Canyon because it’s such a large, unwieldy book. It would have been nearly impossible to get through without the help of many hands. It’s not even available for Kindle, with good reason – a huge part of the reading experience comes from Blaustein’s photographs, taken over many years on trips down the Grand Canyon. The book simply couldn’t exist without those images. Reading it immediately transported me back to my own trip down the Colorado in 2008. In my life, there has been nothing that compares to the experience I had rafting down the Grand Canyon for three weeks. Having a child changed my life by magnitudes, but I was expecting that. People have babies. It’s a thing that’s done, and it is unquestionably one of the best things I’ve ever experienced, but being a parent connects to me to, well, just about everything. I’m part of a web of humanity, past, present, and future, and I feel that connection to other people in ways I had only dreamed of. Rafting through the Canyon, on the other hand, exposed me the natural order, and to a primal version of myself that I never even imagined existed. An experience like that (and I have been on other rafting trips that were a lark, a bit of good fun, an easy way to spend a week) strips away the pretense of character. That illusion I presented to the world? Gone. The very real isolation and danger of such a journey took so much effort that it didn’t leave me any energy to mess around. I was who I was, for better or worse – at times better, and others, worse. A part of me never wanted it to end. I didn’t want to leave behind the deepest part of the canyon. I had a little tribe of people, including my future husband, father-in-law and sister-in-law, who were good company. Everywhere we went, beauty badgered us. Mysteries waited to be uncovered. My body even eventually hardened to the elements (our trip took place during the last week of March and the first two weeks of April, so bitter cold, and eventually unseasonable heat were a factor), and my fear got real comfortable living right on the surface. Looking back, I was deeply ignorant of just how dangerous the experience was, which is probably as it should be. When I opened up this book and dove in to Abbey’s experiences on the same river, it was as though no time had passed. Names I thought I had forgotten surged to the surface. Campsites reemerged from foggy memory banks. Rapids that had terrified me were scarcely mentioned, and rapids that demolished him, I remember with fondness. The book was recommended to me by a good friend who had been on the trip with me, and I purchased it for my father-in-law, or the man with the golden ticket. He was one of the last people to “win” a trip on this river from the waiting list he had been on for twenty years (the system changed to a lottery the very next year). I still remember exactly where I was when he called my (not yet) husband to invite him on the trip. When the phone was handed over, and I heard him ask me if I wanted to join a crew of sixteen (all of whom were much more experienced than me), I didn’t hesitate. I didn’t research. I didn’t ask if it was safe. I just said yes. After reading about Abbey’s trip, I was reminded of that exuberant yes. Of jumping headlong into an experience that would change me forever without a moment’s regret. I was terrified for so much of that three weeks, and yet I know I would say yes again in a heartbeat. I suppose it’s not so different from having a child after all – filthy clothes, questionable hygiene, unmitigated laughter and gibbering terror – although without a doubt, down in the canyon, there is a much deeper quiet to be found. Welcome to 2016! I’m not going to crack any jokes about making or breaking resolutions a week in as it’s been years since I’ve even considered making some of my own, and honestly, the only other thing I can think of right now is that we’re now officially in Election year, and the whole political circus is going to be amped up to eleven until November. Just thinking about it is making me tired, so instead of dwelling on the questionable success of new starts and uncontrollable windbaggery, let’s break open that bag of emergency marshmallows (what? You don’t have an emergency bag of marshmallows?!) and make some reading-escape appropriate cocoa. Now, that we’ve settled in, I have to admit I’ve been on a little break from novels the last two months. During November, I was doing my own new-mom adaptation of National Novel Writing Month, where, instead of writing a completely impossible 50,000 words, I was trying to finish the first draft of the cozy mystery started last summer. Spoiler alert: I failed. I did get five chapters written, which was certainly better than nothing, but I had to extend my deadline to December 31 (which fortunately, I was able to meet). The whole endeavor was surprisingly difficult even though I was only eight chapters from the end. It was also much harder than any of the years I’ve done a traditional NANO novel, probably because I care more about this book than I do the crazy stories I’ve written in great speed in the past. On top of that, I care more about my son than I do about deadlines, which is both wonderful and challenging. On the one hand, writing makes me feel like a million bucks – on the other, well, I’m not the first parent to struggle with this particular problem. But I digress. I was talking about my break from novels, not lamenting the existence Hermione Granger’s time-turner. I like to take a break from fiction when I’m doing a lot of my own writing. It clears my head and allows me to focus on working through those ideas rather than procrastinating with another writer’s story. Obviously, I can’t just give up reading though, so I often find myself a little niche to explore. This time around, it has been comediennes. Amy Poehler’s book was a recommended read after I finished Mindy Kaling’s, although it was a far different experience. Poehler is a much more serious person than I realized, and her book certainly reflects that. Unlike Tina Fey or Kaling, her focus is less on a laugh out loud read (although I did) than it is a grittier look at her own experiences. She hasn’t sugar-coated her past failures here. She’s done some things that certainly don’t endear her, but her response to those choices, and her perspective as an older comic and woman were powerful and worthy of respect. The hardest day in Haiti for me was when we visited a few orphanages. Some of these places were doing the best they could. Others had a long way to go. Jane’s colleague Noah and I saw babies living in cribs that looked like cages. A little boy named Woosley jumped into Noah’s arms and wouldn’t let go. He was desperate for attachment, and men were especially scarce. Woosley held on to Noah like a bramble. We were filled with anxiety because we knew we would have to say good-bye. Noah had to drop him back off at his crowded room, and Woosley hung on and started to get upset. He finally got down and faced a corner as he cried. It was the loneliest thing I have ever seen. A teacher went to him, but it barely comforted him.